Mom's Gone Bronson! 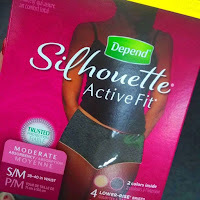 : Depend Active Fit, Free Sample and #underwareness for all!! Depend Active Fit, Free Sample and #underwareness for all!! Over 51 million American women experience bladder leakage in their lifetime, and the stigma attached to it is slowly becoming a thing of the past, especially with the #underwareness campaign from Depend! Now in a more flattering look, Depend Silhouette comes in black and beige, too suit your wardrobe and in a lower rise brief with comfortable fit and discretion for your sanity! Let's face it, no one wants to talk about pee, but pee happens and, even in a drip, dribble or waterfall, Depend has your back!! No more labels, no more embarrassment, just you, me and Depend, out on the road, living life to the full! Here's a fun fact! There are more people in their 20's, than 80's, with bladder leakage and it is an everyone problem, not just something that comes with age! You are not alone!! Now at its 2 year point, with the #underwareness campaign, Depend is conquering the taboos surrounding incontinence and people are speaking out, and consequently aiding a good cause as well! As part of the #unawareness campaign, for every photo or video shared, in support of women with bladder leakage (lbl), using the hash tag #underwareness PLUS Depends products, the Depend brand with donate $1, up to $3 million, right through to 2016, which will help fund charities, which b ultimately contribute to education and research associated with bladder leakage! If you haven't tried Depend, yet, then head over HERE to their website for more information and a free sample! Enjoy comfort and #underwareness, all day long!